In an effort to educate the public about the dangers of distracted driving, the Transportation Improvement Association created the “Remembering Ally: Distracted Driving Awareness Campaign” in 2011. The campaign was named in memory of Ally Zimmerman, a 16-year-old Romeo High School student and Oakland County resident, who was hit by a distracted driver on December 28, 2010. She later died from her injuries. The “Remembering Ally: Distracted Driving Awareness Campaign” was honored at the Governor’s Traffic Safety Advisory Commission (GTSAC) annual awards luncheon on Wednesday, March 27, 2013 for disseminating information about the dangers of distracted driving. 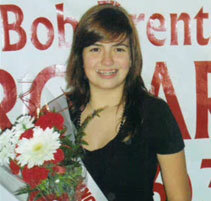 As a 16-year-old award-winning performer, Allysun (Ally) Zimmerman loved giving back to others. She had many dreams of changing the world. But her dreams, along with her life, were taken away by a distracted driver. When you drive distracted you endanger your life and the lives of those around you. As a junior in high school, Ally loved everyone and everything. She was the first to lend a hand, a shoulder to cry on, or a creative idea. She spoke her mind frequently and with respect. Ally did not deserve to have her life taken away and neither do you. What is the Remembering Ally: Distracted Driving Awareness Campaign? The Transportation Improvement Association (TIA) developed the “Remembering Ally: Distracted Driving Awareness Campaign” to promote safe, non-distracted driving. The campaign advocates that all drivers need to keep their eyes on the road, and their hands on the wheel. With the help of TIA, numerous agencies and businesses, Ally’s family and friends, and many others, the “Remembering Ally: Distracted Driving Awareness Campaign” travels statewide to spread Ally’s story and increase awareness amongst drivers and passengers. • Speak up about your driving and let others know that you are not or will no longer be a distracted driver. • Change your habits! If the phone rings or you receive a text message and you do not have a hands-free device, do not pick up the phone. • Find a spot in a parking lot before answering. • Call back after arrival and the motor vehicle is completely stopped. • Have another passenger answer or respond. • Be a leader, not a follower. If you are ever a passenger in a car with a distracted driver, speak up before it is too late. Do not let another person’s actions determine your future. • Share Ally’s Story. Some people think that a traffic crash could never happen to them. You may not be the distracted driver or the cause of a crash, but it can still happen to you; just as it happened to Ally. • Download Ally’s campaign poster (PDF). Hang Ally’s posters up as a reminder for family, friends, and yourself. Ask your school or work permission to hang posters for awareness.